By anyone’s standards Pentecost was a significant day. It is the purpose of this article to treat the significant aspects of the day in relation to certain major areas of theological studies. Typology has suffered a great deal at the hands of both its friends and its enemies, since for many the study of types is still an uncertain science. Some, it is true, have found types in everything, while others in their reaction against this give little or no place for typological studies. My own definition of a type is that it is a divinely purposed illustration which prefigures its corresponding reality. This definition not only covers types which are expressly designated so by the New Testament (e.g., 1 Cor 10) but also allows for types not so designated (e.g., Joseph as a type of Christ). Yet in the definition the phrase “divinely purposed” should guard against an allegorical or pseudo-spiritual interpretation of types which sees chiefly the resemblances between Old Testament events and New Testament truths to the neglect of the historical, geographical, and local parts of those events. While all things are in a sense divinely purposed, not all details in all stories were divinely purposed illustrations of subsequently revealed truth. Pentecost is a good example of this, for although there is a clear type-antitype relationship, not all the details of the Old Testament feast find a corresponding reality in the events recorded in Acts 2. As the antitype of one of the annual feasts of the Jews Pentecost has significance. This feast (Lev 23:15–21) was characterized by an offering of two loaves marking the close of harvest. The corresponding reality of this ceremony was the joining on the day of Pentecost by the Holy Spirit Jew and Gentile as one loaf in the one body of Christ (1 Cor 12:13). Pentecost is sometimes called the feast of weeks because it fell seven (a week of) weeks after Firstfruits. No date could be set for the observance of Firstfruits, for that depended on the ripening of the grain for harvest. However, when the time did arrive a small amount of grain was gathered, threshed, ground into flour, and presented to the Lord as a token of the harvest yet to be gathered. The corresponding reality is, of course, “Christ the firstfruits” (1 Cor 15:23). The fifty days interval between the two feasts was divinely purposed in the Old Testament type and finds exact correspondence in the New Testament antitype. The theological significance of Pentecost concerns chiefly the doctrine of the Holy Spirit. The third person of the Trinity, not Peter, played the leading role in the drama of that day; He is the power of Pentecost; and in a very special sense the era which followed is His age. Obviously the Spirit of God has always been present in this world, but He has not always been a resident as one who permanently indwells the church. This was a new relationship which did not obtain even during the days of our Lord’s earthly ministry, for He said to His disciples concerning the Spirit, “He dwelleth with you, and shall be in you” (John 14:17). Wind. A sound as of a rushing mighty wind was the first evidence of the Spirit’s coming. It came suddenly so that it could not be attributed to any natural cause, and it came from heaven, which probably refers both to the impression given of its origin and also to its actual supernatural origin. It was not actually wind but rather a roar or reverberation, for verse two should be literally translated “an echoing sound as of a mighty wind borne violently.” It filled all the house which means that all of the 120 would have experienced the sensation since so many people would of necessity have been scattered throughout the house. This was a fitting evidence of the Spirit’s coming, for the Lord had used this very symbol when He spoke of the things of the Spirit to Nicodemus (John 3:8). Fire. The audible sign, wind, was followed by a visible one, fire. Actually the tongues which, looked like fire divided themselves over the company, a tongue settling upon the head of each one. This, too, was an appropriate sign for the presence of the Holy Spirit, for fire had long been to the Jews a symbol of the divine presence (Exod 3:2; Deut 5:4). The form of the original text makes one doubt the presence of material fire though the appearance of the tongues was clearly as if they had been composed of fire. Languages. Finally, each began to speak in a real language which was new to the speaker but which was understood by those from the various lands who were familiar with them. This was the third piece of evidence, and although some have assumed that this miracle was wrought on the ears of the hearers, this certainly forces the plain and natural sense of the narrative. These tongues were evidently real languages (vv. 6–8) which were spoken, and the imperfect tense, “was giving” (v. 4), indicates that they were spoken in turn, one after another. Baptism. The most important effect of the Spirit’s coming at Pentecost was the placing of men and women into the body of Christ by His baptism. Our Lord spoke of this baptizing work of the Holy Spirit just before His ascension (Acts 1:5), and it is clear from His words that this was a ministry of the Spirit thus far unknown even to those to whom He had said, “Receive ye the Holy Ghost” (John 20:22). If the baptism of the Holy Spirit was not something new to men until the day of Pentecost, then the Lord’s words in Acts 1:5—and especially the future tense of the verb “ye shall be baptized”—mean nothing. Although it is not specifically recorded in Acts 2 that the baptism of the Spirit occurred on the day of Pentecost, it is recorded in Acts 11:15–16 that this happened then, and Peter states there that what happened at Pentecost was the fulfillment of the promise of Acts 1:5. However, it is Paul who explains what this baptism (not to be confused with what is meant in Acts 2:38) accomplishes when he writes, “For by one Spirit are we all baptized into one body, whether we be Jews or Gentiles, whether we be bond or free; and have been made to drink into one Spirit” (1 Cor 12:13). In other words, on the day of Pentecost men were first placed into the body of Christ and that by the baptism of the Holy Spirit. 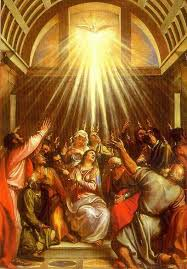 Since the church is the body of Christ (Col 1:18), the church could not have begun until Pentecost. Furthermore, since no reference to the baptism of the Spirit is found in the Old Testament, since all references in the gospels are prophetic, and since in all prophecies of the future kingdom age there is no reference to the Spirit’s baptism, we may conclude that this work of His is peculiar to this dispensation and peculiar to the church (which, it follows, must also be limited to this dispensation) in forming it and uniting the members to the body of Christ forever. Bewilderment. Certain visible effects of the Spirit’s coming were evident in the crowd which gathered as a result of the phenomena connected with His coming. At first the people (including Eastern or Babylonian Jews, Syrian Jews, Egyptian Jews, Roman Jews, Cretes and Arabians) were amazed. Literally the text says that they stood out of themselves with wide-open astonishment (v. 7). This is a mental reaction showing that their minds were arrested by what they observed. Next they were perplexed (v. 12). This is a strong compound word from an adjective which means impassable and hence the word comes to mean to be wholly and utterly at a loss. This was mental defeat. “The amazement meant that they did not know. The perplexity meant that they knew they did not know.” Not knowing is always a blow to man’s pride; consequently this crowd, driven to find an answer to what they had seen and heard, replaced their ignorance with criticism (v. 13). These are merely normal reactions of Satanically-blinded minds to which the things of God are foolishness (2 Cor 4:4; 1 Cor 2:14) and should not surprise us if they occur today. The offense of the cross has not ceased. Introduction—Explanation. Peter, spokesman for the eleven, seized the opportunity for a witness by answering the charge of drunkenness which had been levelled at the apostles. He thus wisely introduced his sermon by using the local situation, and taking that which was uppermost in his hearers’ thoughts. He formulated his introduction as an explanation of that which they had just seen and heard (v. 15). Strangely enough he did not introduce his message with a story or joke. Nothing in the situation seemed to remind Peter of a certain story, etc. Peter’s mind was full of Scripture, not stories; Peter’s concern was for the people, not pleasantries. The disciples could not be drunk, he told them, for it was only nine o’clock in the morning. Pentecost was a feast day, and the Jews who were engaged in the services of the synagogues of Jerusalem would have abstained from eating and drinking until at least 10 a.m. and more likely noon. From this categorical denial of the charge of drunkenness Peter passed easily and naturally to the explanation of what the phenomenon was. It was not wine but the Holy Spirit who was causing these things, and to prove this Peter quoted Joel 2:28–32. This is a very definite prophecy of the Holy Spirit’s being poured out when Israel is again established in her own land. The problem here is not one of interpretation but of usage only. Clearly Joel’s prophecy was not fulfilled at Pentecost, for (1) Peter does not use the usual Scriptural formula for fulfilled prophecy as he does in Acts 1:16 (cf. Matt 1:22; 2:17; 4:14 ); (2) the original prophecy of Joel will clearly not be fulfilled until Israel is restored to her land, converted, and enjoying the presence of the Lord in her midst (Joel 2:26–28); (3) the events prophesied by Joel simply did not come to pass. If language means anything Pentecost did not fulfill this prophecy nor did Peter think that it did. The usage need not raise theological questions at all, for the matter is primarily homiletical and any problems should be solved in that light. Peter’s point was that the Holy Spirit and not wine was responsible for what these Jews had seen. He quotes Joel to point out that as Jews who knew the Old Testament Scriptures they should have recognized this as the Spirit’s work. In other words, their own Scriptures should have reminded them that the Spirit was able to do what they had just seen. Why then, someone may ask, did Peter include the words from Joel recorded in Acts 2:19–20? Why did he not stop with verse 18? The answer is simple. Peter not only wanted to show his audience that they should have known from the Scriptures that the Spirit could do what they had seen, but he also wanted to invite them to accept Jesus as their Messiah by using Joel’s invitation “whosoever shall call on the name of the Lord shall be saved” (v. 21). Thus what is recorded in Acts 2:19–20 is simply a connecting link between the two key points in his argument. “The remainder of the quotation from Joel, verses 19, 20, has no bearing on Peter’s argument, but was probably made in order to complete the connection of that which his argument demanded.” (J. W. McGarvey, New Commentary on Acts of Apostles, p. 28). Theme—Jesus is Messiah. To us today it does not mean much to say that Jesus is Christ or Messiah. To a Jew of that day this was an assertion which required convincing proof, and it was the theme of Peter’s sermon. Peter’s proof is built along very simple lines. First he paints a picture of the Messiah from the Old Testament Scriptures. Then from contemporary facts he presents a picture of Jesus of Nazareth. Finally, he superimposes these two pictures on each other to prove conclusively that Jesus is Messiah. The center of each picture is the resurrection. In verses 22–24 there is a proclamation of the resurrection of Jesus of Nazareth. Then there follows (vv. 25–31) the prediction of resurrection from Psalm 16:8–11 which Peter applies to the Messiah. Finally, the Messiah is identified as Jesus whom they crucified and of whose resurrection they were witnesses. It is important to notice that the truth of Jesus’ resurrection was not challenged but was well attested by the conviction of these thousands of people who were in the very city where it had occurred less than two months before. Conviction. Peter’s sermon brought conviction of heart. The word translated “prick” is a rare one which means to pierce, stun or smite. Outside the Scriptures it is used of horses dinting the earth with their hoofs. In like manner the hearts of his hearers were smitten by Peter’s message as the Spirit of God applied it. Conversion. To the group of 120 (which included men and women, Acts 1:14) were added 3000 souls (Acts 2:41). They repented or changed their minds, for that is the meaning of repentance. It is not mere sorrow which is related to the emotions, for one can be sorry for sin without being repentant. Neither is it mere mental assent to certain facts, for genuine repentance involves the heart as well. For the Jews gathered at Pentecost it involved a change of relationship toward Him whom they had considered as merely the carpenter’s son of Nazareth and an imposter by receiving Jesus as Lord and Messiah. The Spirit of God must always do the work of enlightening and converting, but men are still His method of heralding the message. May our sermons be like Peter’s—doctrinally sound, homiletically excellent, filled with and explanatory of the Word of God, and aimed at those to whom we speak. In the realm of practical theology two things command attention from among the many events of Pentecost and the days which immediately followed. To the question “What shall we do?” Peter replied, “Repent and be baptized.” That this refers to the new converts’ being baptized by the Spirit is untenable for several reasons. (1) It is doubtful that Peter himself and much less probable that his hearers understood yet the truth concerning the baptism of the Spirit even though it did first occur at Pentecost. (2) If this were referring to that automatic ministry of the Spirit then there would be no need for the report of verse 41: “Then they that gladly received his word was baptized.” (3) What would this audience have understood by Peter’s answer? His words meant that they were to submit to a rite performed with water which would be a sign of their identification with this new group. They would have thought immediately of Jewish, proselyte baptism which signified entrance of the proselyte into Judaism (Cf. Alfred Edersheim, The Life and Times of Jesus the Messiah, II, 745–47, for a concise discussion of the baptism of proselytes). They would have thought of John’s baptism, submission to which meant identification with John’s message in a very definite way; for John was the first person to baptize other people (all proselyte baptisms were self-imposed), which was a striking way to ask people to identify themselves with all that he stood for. They would have realized that they were being asked to identify and associate themselves with this new group who believed Jesus was the Messiah, and Christian baptism at the hands of these disciples signified this association as nothing else could. (NOTE: The language of verse 41 implies that the 3000 converts were all baptized on the same day. There were numerous pools and reservoirs in Jerusalem which would have provided the facilities for this even by immersion. If all the 120 disciples assisted in administering the ordinance it could easily have been done in a very short time. The magazine Life in its August 14, 1950, issue reported a modern instance where 34 men immersed 3381 converts in 4 hours). Even today for a Jew it is not his profession of Christianity nor his attendance at Christian services nor his belief in the New Testament but his partaking of water baptism that definitely and finally excludes him from Judaism and sets him off as a Christian. And there is no reason why it should not be the same line of demarcation for all converts to Christianity, signifying the separation from the old life and association with the new. (NOTE: A. T. Robertson explains well the meaning of the words “unto the remission of your sins” (v. 38), and his words are here quoted lest any misinterpret the words of Peter to teach baptismal regeneration. “In themselves the words can express aim or purpose for that use of eis does exist as in 1 Cor 2:7…. But then another usage exists which is just as good Greek as the use of eis for aim or purpose. It is seen in Matt 10:41…where it cannot be purpose or aim, but rather the basis or ground, on the basis of the name of prophet, righteous man, disciple, because one is, etc. It is seen again in Matt 12:41 about the preaching of Jonah…. They repented because of (or at) the preaching of Jonah. The illustrations of both usages are numerous in the N.T. and the Koine generally…. I understand Peter to be urging baptism on each of them who had already turned (repented) and for it to be done in the name of Jesus Christ on the basis of the forgiveness of sins which they had already received.” [Word Pictures in the New Testament, III, 35–36]). Its commencement. We have already noted how the church as an organism, the body of Christ, began on the day of Pentecost. But the church as an organization also began that day as the Lord added 3000 souls. Its continuance. The power of the early church, humanly speaking, was due largely to the facts recorded in Acts 2:42. There was no rapid falling away from the newly-embraced faith. Indeed, just the opposite was true, for membership in the early church involved persevering adherance. They continued in the apostles’ doctrine. “The church is apostolic because it cleaves to the apostles….” Teaching had always had a prominent place among the Jews, and it is not strange to find the Christian group appearing as a school. The apostles were the first teachers, and the bulk of their teaching we now have in the gospels. It consisted of the facts of the Lord’s life as well as His doctrine and teaching. The church today could well afford to emulate the early church in this. Instead of capitalizing on new converts and exploiting them, we should teach them even if that means keeping them in the background for a while. Furthermore they continued steadfastly in fellowship, and this is evidently to be understood in the broadest sense of the word, for the text says “the fellowship.” This means partnership with God, partnership with others in the common salvation and in the sharing of material goods. They also continued in the breaking of bread which refers to the Lord’s Supper though not isolated but as the climax of the agapé or love feast. At the very first this was evidently observed daily (v. 46) though afterward it seemed to form the great act of worship on the Lord’s Day (20:7). At least we must say that the early church remembered her Lord with great frequency and with great freedom, for it was observed in homes without distinction between ordained clergy and laity (no service of ordination having yet occurred in the church). Finally the record says that they continued in prayers. Again the definite article is used with this word and probably indicates definite times for prayer. Further, this is a word that is used exclusively for prayer to God and indicates the offering up of the wishes and desires to God in the frame of mind of devotion. Its characterization. The early organization was characterized by fear (v. 43), favor (v. 47), and fellowship (vv. 44–46). Fear kept coming on this new group as signs and wonders kept on being done through the apostles (both verbs are in the imperfect tense). This fear was not alarm or dread of injury but a prevailing sense of awe in the manifest presence of the power of God. Favor was also their portion with the people at this time although times changed very quickly. Finally, fellowship in spiritual things demonstrated itself in fellowship of goods and worship. No doubt many of the pilgrims to the feast of Pentecost lingered in Jerusalem after their conversion to learn more of their new faith, and this created a pressing economic need. Providing for them through the sale and distribution of goods was God’s way of meeting this emergency. The necessity for this was probably shortlived though we know that the saints in Jerusalem remained a poor group. This is the significance of Pentecost—the type fulfilled, the Holy Spirit baptizing men for the first time into the body of Christ, the sermon built on the resurrection and bringing conviction and conversion, and the young church marked off and established in the word and ways of the Lord. Article adapted from BSac 112:448 (October 1955) pp. 331-340.